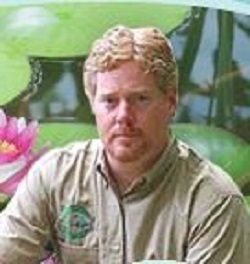 The other half of the fun one gets from acquiring this popular water gardening plant is that it is easy to care for and really helps to filter your pond’s water by sucking up nutrients from the pond and helping remove floating particles. Parrotfeather is indeed a nice looking plant choice for your water garden pond. It will grow well at various depths within the pond thriving with water up to 10” above its crown. But it is also not a picky plant, and can even grow in very shallow water or on shoreline mud flats. Parrotfeather is a nice green color, and yes, actually a green similar to that of many parrots. It is a soft looking plant and soft to the touch as well, but boy is it tough! Often sold as a tropical this plant will over winter in areas that receive freezing weather and snow cover and bounce back beautifully year after year, sometimes even getting invasive in some ponds. Because of its aggressive growth ability it is best kept in a more controlled water garden setting. Introducing Parrotfeather to natural or mud bottom ponds could become a major regret once the plants choke the entire shoreline. Water gardens or even small container ponds and patio ponds are a great way to enjoy parrot feather. Parrotfeather, or Myriophyllum aquaticum, roots below water and sports a thick hardy red colored stem from which the leaves of the plant grow. Below water the leaves may look yellowed, while above water leaves are bright green and are whorled around the stem. Roots will also grow from the internodes of the plant allowing it to root easily even into loose gravel. The leaves of Parrotfeather grow along the surface of the water and can extend out 6+ feet from the plant container. 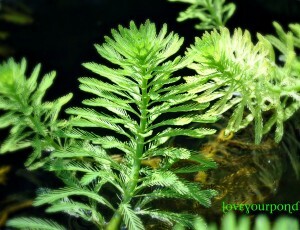 The leaves of Myriophyllum aquaticum sometimes growing up to 12” out of the water. Small white flowers develop as well, as in several other aquatic weeds of this type. Like many invasive aquatic weeds that have escaped into natural waterways, Parrotfeather can clog waterways and provide habitat for mosquitoes; the expense of controlling such a plant can be tremendous and chemical controls dangerous so it is best kept as a water garden or aquarium specimen. Today Parrotfeather has wild populations in close to 30 states as far west as California, after its original introduction in the Washington D.C. area in the late 1800’s. In some states it is illegal, prohibited, and banned or classified as a invasive noxious plant. The only place this plant may be welcome is in our backyard ponds! With proper management and care this is a top pick water garden plant that helps filter water through its uptake of nutrients, its roots offer a food source for fish to pick at as well as a great area for fish fry to hide and grow. Be sure to prune the plant back several times each season carefully disposing of the clippings into the garbage preferably bagged. To prune Parrotfeather just pinch off the overgrowth. If you want more parrotfeather in your pond take the clippings and tuck them into some rockwork and gravel and watch them grow! 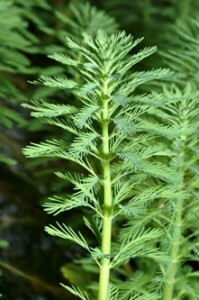 Parrotfeather is a great plant for beginner water gardeners as well as the seasoned “wet thumbers”. Parrotfeather is available in most water garden centers and easily found online. I purchased parrot feather at a nursery for my new (first) pond. They said I could propagate it from the roots (which I did in my greenhouse). It’s growing great in the greenhouse, but NOT in the pond. The lower foot is below water and barren and only an inch or so is above water and green. I’m rooting some more in the greenhouse and will put it in the pond again to see what happens. I’ve been putting it in as a floating plant, should I pot it up? I just built my first pond with a 4 foot waterfall, the pond is about 9 foot wide by 20 foot long and 2 foot at its deepest point. I made the pond for my 4 ducks and 2 geese. I’m trying to find out if parrots feather is a good plant for my ducks and geese to eat. Your input would be greatly appreciated. I put some in an empty red wine bottle filled with water and it turned red. So if anyone wants to do that please let me know if it worked for you. As good as this plant looks, it is not something people should plant in there ponds, as it is an invasive weed. I can’t keep parrot feathers in my tilapia pond! They either ear it or it is disappearing. I love the looks and it certainly does not multiply in my pond. Interesting article, could you recommend a good plant for a small butler sink pond to help stop it going green? Hey Bob, thanks. Parrotfeather is routinely sold in water garden centers, and it is true that it can be very invasive; and hardy even to the point of handling freezing winters. I have even seen parrotfeather out of control in local New Jersey farm pond ponds, etc. With any plant people should look into local recommendations on what plants to use. Thanks again! Parrots feather is also an invasive weed across north america. It should never be used outside of an aquarium. Great article, in the UK this plant has been banned, no body is aloud to sell it anymore! Other myriophllum varietys are ok here.